The cooking instructions for this recipe rely heavily on you knowing the temperament of your grill. How is my grill you ask? Oh, I would be happy if it made hot dogs hot. Yeah, it is time to upgrade. That being said, this pizza was incredible! 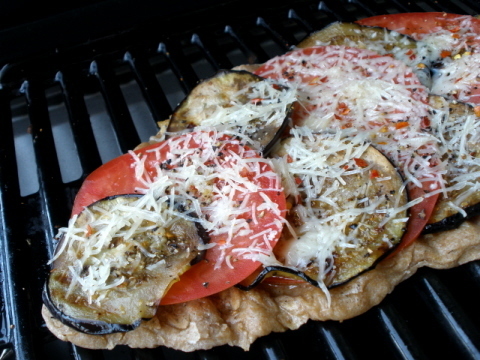 The flavors were fantastic and melded beautifully into a summertime version of Eggplant Parmesan. I used one half of the recipe of Cheri’s Favorite Pizza Dough, but substituted ½ of the flour for whole wheat. It gave it a nice earthy flavor and required an extra hour in rise time. Need some more ideas for pizza night? Get all 23 weeks worth here.